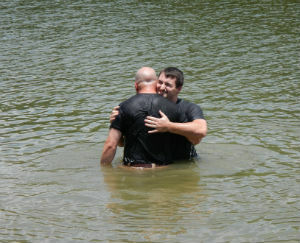 Photo: Pastor Joey celebrates first baptism at the lake. When doing ministry in the sparsely populated countryside of Louisiana, one comes to an inescapable conclusion: life…happens…slooooowly. Not that everyone speaks at the rate of Mountain Man (fans of the state’s famed Duck Dynasty television show will understand); rather, the pace of everyday activities seems to take on a refreshing calm. Ask Joey Pepmiller, pastor of Eva Church of God in the unincorporated community known as Monterey. Joey knows the blessings and challenges posed by this relaxed atmosphere. While some readers might panic that the closest Walmart is forty minutes away, these down-to-earth folks take it all in stride. Though large churches often garner the most press, the smaller, rural churches are also making an indelible mark on the kingdom. Amid the cultural nuances, God is up to something big at Eva Church of God. Monterey, Louisiana, is positioned in a parish that averages seven residents per square mile. Hunting for almost anything with four legs is the hobby of choice. Here, sweat tea and face-to-face conversation—not Facebook conversation—exemplify sun-drenched afternoons. When weather permits, the saints really do gather at the river—or lake—to baptize new believers. This iconic imagery may seem idyllic for those tired of crowds and traffic snarls, but ministry in rural America does require getting your feet muddy—and not just up to your knees on Baptism Sunday. Joey and his wife Lexi are graduates of Mid-America Christian University in Oklahoma City. While there, they formed friendships that will last a lifetime. “While attending MACU, I was able to meet Steve Seaton,” Joey explains. “Steve was one of my professors, but he soon became my mentor, friend, and what I consider to be family. Steve came into my life at one of my lowest points, and took me to the limits of who I ever thought I could be. He taught me how to love others genuinely and to be selfless in my ministry to them.” Now Joey and his wife have named their daughter after him: Penelope Seaton Pepmiller. Though Louisiana wasn’t his first choice, he followed up on his commitment to go wherever the Lord would direct. The culture shock wasn’t too severe, as Joey and Lexi both had grown up in Oak Grove, Louisiana. One challenge they face is the low number of people from which to draw to special events and services. Even if everybody in the area attends, it’s still not a large number, especially when multiple churches of various denominations dot the landscape. And though there are positives to doing ministry in a relaxed-pace culture, it also means that worship services generally start at least ten minutes late. It also means that bringing together the whole church at one time in one place can be next to impossible. On the other hand, the slow pace also offers Joey and his wife the chance to develop deep relationships with individuals and families. This entry was posted in All Church of God, Central and tagged church, church growth, country, culture, Eva Church of God, Joey Pepmiller, Louisiana, rural. Bookmark the permalink.